In Super Brain, RudyTanzi and Deepak Chopra, discuss how to use your brain as a gateway for achieving health, happiness, and spiritual growth. You get to decide how you feel and view the world. What you feed your brain - in other words, what you think about, the kinds of thoughts you have (positive, negative), and your attitude determine how you feel. Alzheimer's research indicates that those who think negatively about aging are more like to suffer from Alzheimer's Disease. Newly published research led by the Yale School of Public Health demonstrates that individuals who hold negative beliefs about aging are more likely to have brain changes associated with Alzheimer's disease, memory loss, and signs of dementia. The study suggests that combating negative beliefs about aging, such as elderly people are decrepit, could potentially offer a way to reduce Alzheimer's symptoms. The study led by Becca Levy, associate professor of public health and of psychology, is the first to link the brain changes related to Alzheimer's disease to a cultural-based psychosocial risk factor. Study authors examined healthy, dementia-free subjects from the Baltimore Longitudinal Study of Aging, the nation's longest-running scientific study of aging. Based on MRIs, the researchers found that participants who held more negative beliefs about aging showed a greater decline in the volume of the hippocampus, a part of the brain crucial to memory. 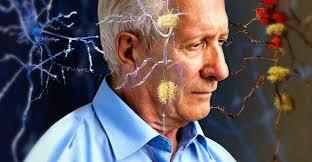 Reduced hippocampus volume is an indicator of Alzheimer's disease. amyloid plaques, which are protein clusters that build up between brain cells; and neurofibrillary tangles, which are twisted strands of protein that build up within brain cells. Participants holding more negative beliefs about aging had a significantly greater number of plaques and tangles. The age stereotypes were measured an average of 28 years before the plaques and tangles. The findings were published online in the journal Psychology and Aging.